You are officially a professional makeup artist and are ready to conquer the world. You’re excited to put into practice the things you learned in school as well as live out your passion for making others feel beautiful inside and out. As excited as you may feel, you may be wondering what your clients’ expectations are and what kind of questions they’ll ask. If this is your first consultation with a client, it is important to ask questions. In most cases, clients will hire a makeup artist right before a special event such as a wedding, or an important dinner party or any special occasion where the client wants to look and feel their best. What type of event will you be attending? What time of day will the event be held? What is your personal makeup routine like? What is the outfit that will be worn to the event? What makeup style do you use when going out to an event? What area do you want to highlight or minimize? 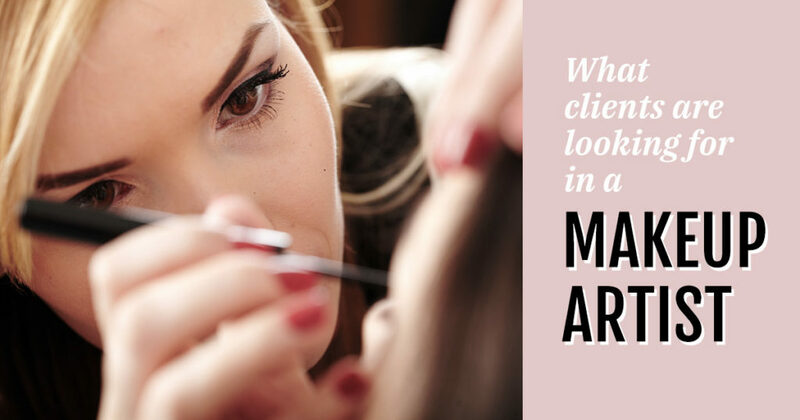 If you know already a little about the client, such as the type of event she is attending, and the general style she is going after, you can research makeup ideas, look through your makeup supplies and practice a couple makeup techniques. Try and figure out what the client would love. Prior to the consultation, prepare your makeup kit and face charts to give the client a visual of what the finished result will be. Bring along all your work samples for the client to look at and get better acquainted with your style. It is a good idea to only bring what the client may want and some additional alternatives. Don’t bring your entire makeup kit. You should also consider your fee rate. As a new cosmetic artist, you may feel like you need to put in a few uncompensated hours to build up your portfolio and have the arsenal to then back up your rate. Clients, however, expect to pay you for your time, regardless of how little experience you have. In fact, every makeup artist, including those fresh out of beauty school need to be compensated for their time. Don’t be afraid to bring up payment either before or during the consultation. It is actually best to be up-front with the client about fees for your services. Clients expect their makeup artist to be friendly, personable, professional and someone they can trust with their appearance. It is important you engage with your client and make her feel comfortable. Come to the consultation dressed in professional dress, and a friendly, confident and excited attitude. Ask the client question both about her makeup routine and maybe some personal, off-topic questions about the event. Ask the client to be open with you and encourage her to give you feedback. Put the client at ease by being flexible and adapting your techniques and color options to match the client’s wishes and needs. As you’re doing her makeup, explain to her everything that you’re doing and why. Chances are the client may not be completely sure of what she wants. Because of this, it is important to come to the consultation full of ideas, recommendations and suggestions. Regardless of whether the consultation is a trial run or the real deal, the client should be wowed when she looks at herself in the mirror after the consultation. Listen to the client and don’t be afraid to infuse some of your own personality, creativity and unique artistry skills. Clients expect friendly professionalism from their makeup artist. They expect to compensate a professional for their service and knowledge of what is best makeup look for their event. To be a professional makeup artist, choosing your education from an acclaimed beauty school is critical. Taylor Andrews is a highly reputable school with alumni all around the world. Our instructors are highly regarded in their respected cosmetic specialty and students will get a comprehensive education mixed with real-world, hands-on experience. To learn more about Taylor Andrews or to enroll in our makeup artistry course or one of our cosmetology programs, request more info today!